Smart LED-technology, fast at home! The webshop for Wi-Fi LED lightning with an APP or with remote control! Get your business account: Get here a business account. Bigger orders / Request a quote: Send us an mail!. 5 meter RGBW LED strip with a total of 180 LED's. 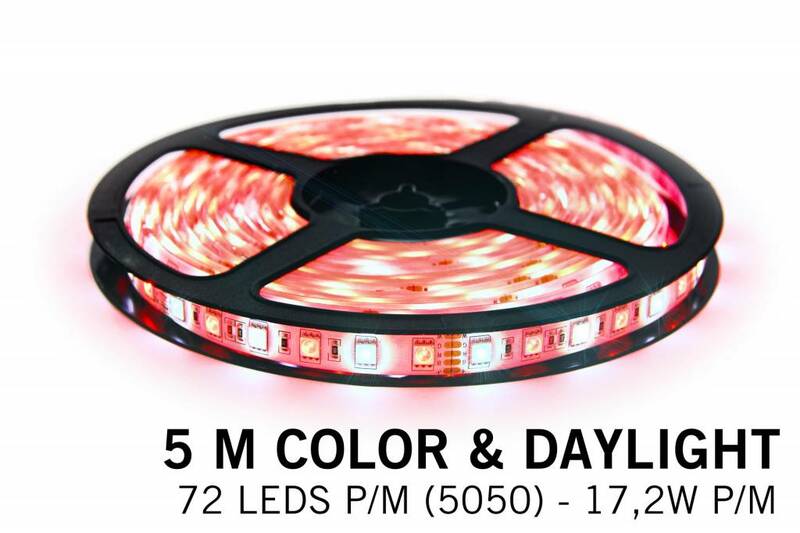 These high quality LED strips are specially manufactured to our specifications. The mix of color and cold white LED's (6000K) is perfect for additional lighting during the day and a beautiful decorative color in the evening. This versatile RGBW strip contains A-quality LEDs and leaves many other RGBW LED strips behind with its long life span and high brightness SMD 5050 LEDS. For a stylis finished result and better light distribution, you can place the LED strip in an aluminum profile. This RGBW LED strip profile can be found here. 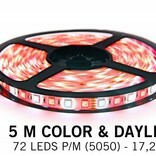 The RGBW LED strip with 72 LED's per meter (36 daylight white, RGB color 36) has a length of 5 meters.